A mouse can seem harmless with its big eyes and cute ears, but it also can be the ideal vehicle for spreading diseases. Mice can transmit diseases to humans and other animals through biting, droppings, fleas, lice, mites and ticks. 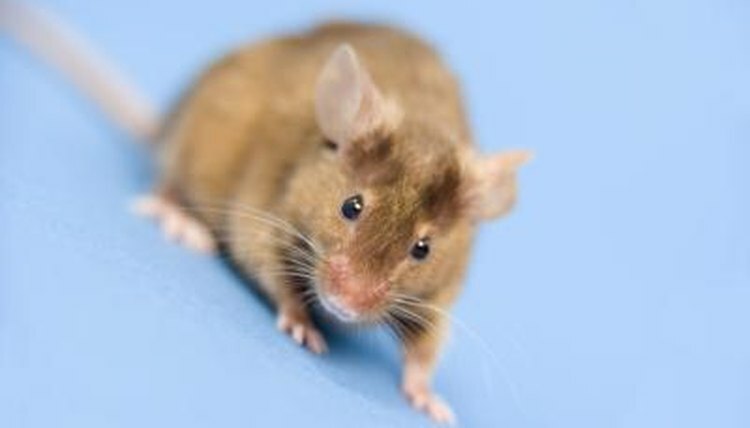 Some of the common diseases carried by mice are salmonella, hantavirus, leptospirosis, rat-bite fever and the plague. Salmonella and Hantavirus Pulmonary Syndrome are spread through contact with mouse droppings, especially when food or water is contaminated by feces. Salmonella symptoms include gastrointestinal pain, vomiting and diarrhea. Hantavirus also can be contracted by breathing in dust contaminated with mice feces, and by bite wounds. Symptoms of Hantavirus include flu-like aches and pains, renal failure and severe respiratory distress. Leptospirosis is bacteria that is spread through mouse urine. It can remain in water or soil for months. Symptoms include high fever, head and muscle aches, vomiting, diarrhea and jaundice. Rat-bite fever can be carried by mice as well as rats. As the name suggests, this disease is spread through bites or scratches. However, it can also be contracted through handling of an infected rodent or consuming infected food or water. The symptoms include fever, body aches, vomiting and a red rash with small bumps. Plague is caused by a bacteria and transmitted by bites from fleas that have fed on infected rodents. Infection can also spread through handling of an infected animal. There are three different kinds of plague: bubonic, septicemic and pneumonic. Symptoms for all three begin with high fevers and extreme weakness. Bubonic plague symptoms also include swollen and painful lymph nodes. Septicemic plague symptoms include abdominal pain, shock, and bleeding into skin and other organs. Pneumonic plague is characterized by respiratory failure and shock. It is the one type of plague that can be spread from person to person. A mouse can transmit diseases to humans both directly and indirectly. Direct transmission can occur when people handle or consume food contaminated with mice feces, or drink from a water source containing a dead mouse. It also can happen when a skin wound comes into contact with mice urine. Indirect transmissions can occur through mites, fleas, mosquitoes, and other parasites after they have fed on infected mice. Most diseases spread by mice can be treated with prompt and proper medical care.